PledgeMe are the first to admit that they’re copying and tweaking an overseas model of crowdfunding, perhaps the best known of whom is Kickstarter. But the local web platform to create, collaborate and support the funding of creative projects reckons the Kiwi-centricness plays into our sensibilities. The year old startup, which really got going at the beginning of this year after a redesign, has just had its 60th successful project funded. This is out of more than 100 projects put up for consideration by New Zealanders, and represents (albeit with a relatively small sample size) a 51% success rate. Chief operating officer Anna Guenther, says the world-wide success rate for crowdfunding is 44%, so at least PledgMe’s on the right side of the bell curve. It is estimated there are about 300 crowdfunding platforms around the world, and about US$1.5bn was pledged last year. As with other crowdfunded projects, project creators often provide a reward for supporters to come onboard. It could be the first edition of a book, a party, or (in the case of a young woman who wanted a few hundred dollars sponsorship to attend an Auckland illustration course) a hand-draw doodle. To date $315,000 has been raised, the largest amount being $21,000 for a documentary on curling (wow, a hidden fan base there! sticK comment). When a project is successful, PledgeMe takes a 5% fee, plus a 3% credit card fee, and the remainder is passed onto the creator. As a business venture, “it’s getting up there,” says Guenther, who, along with original founder Camilo Borges, both work one day a week on PledgeMe. She works the rest of the time on some of NZ Trade & Enterprise’s programmes. Her Masters’ (which she passed with distinction) thesis was on the crowdfunding platforms (of which there were none here when she began. After meeting up with Camilo, she came onboard not long after PledgeMe started. Since its redesign, PledgeMe has experienced exponential growth, and it now receives more than 5000 hits a week. Its next target is 100 successful projects. “It’s a very interesting space to be in,” she says, “and New Zealand’s well positioned for this type of product,” in a country where startup capital can be hard to obtain and there’s a smaller pool of investors able to be tapped. The platform isn’t restricted to arts projects however, and it also includes tech-type projects such as Loomio, an open source decision making software that raised $5,000 to feed their developers. She says the PledgeMe ‘engine’ that has been created can handle many different types of project. The coding behind it is “quite complicated”, and a recent valuation of what it would cost to build PledgeMe from scratch came up with a figure of $1 million. 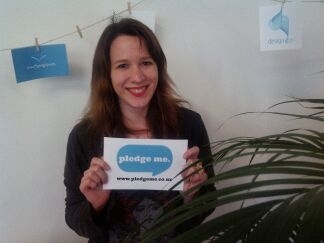 PledgeMe has ten ‘ambassadors’ around the country – people in the creative space who talk about and promote the platform when they’re out and about. Guenther and Borges are often talking to other crowdfunding platforms, tending to regard them as collaborators rather than competition. To this end they’ve recently conversed with Nesta (UK platform to promote innovation), Pozible (an Aussie crowd) and Catarse (a Brazil startup; Borges is Brazilian). Guenther’s not short of optimism and confidence for PledgMe. Where will it be in five years?